Our State Session is behind us now and there will be much information about it in the December edition. Depending on when it was held, the Pink sash meeting may also be over. If it is the state committees have already met and set up all the programs for next year. All this information will now go to the printer for the Blue Book. The Deputies will now be setting up schools of instruction in their Pomonas. That is when the Community Granges will get their Blue Books and State Directories. This is where you, the Grange members, can meet with the State Master face to face. I look forward to meeting you and discussing your concerns of the Grange and answering your Questions. Normally the Pink Sash meeting would have been held after the National Grange conference, but because of the late dates this year it was held before National. 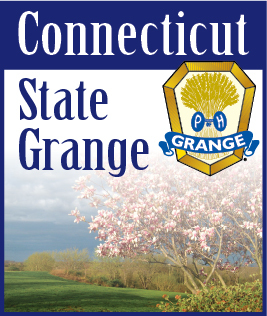 So all the information I have to pass on to you, from National Grange, will be done at the schools of instruction. As I said I will also be available to address any concerns you may have. I want to talk to you. Sister Marge and I are now getting ready to attend the National Session. This will be the last National Session that we will attend as delegates for Connecticut and I want to thank everyone for the opportunity you have given us. These sessions involve much work but they are also enjoyable and we have made many friends throughout the country. We will be doing our best to represent Connecticut and the northeast region as we have a common interest in what happens in our region. I cannot stress, too strongly, the importance of keeping up with our Grange work. That means actively attending our meetings and participating. You can also help a neighboring Grange by visiting them once in awhile. I encourage all State Officers and Pink Sash members to visit neighboring Granges. I can remember my earlier years in the Grange what a joy it was to have someone from the State Grange visit us. I can tell you they really do appreciate it. Sister Marge and I wish all of our Grange family a Happy and Enjoyable Thanksgiving Holiday, and remember those less fortunate then us during this season.